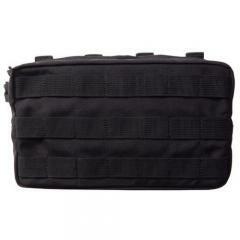 This pouch is great, especially if you want to carry a lot of extra 12 gauge rounds. You may have to work out how to attach it, it uses a system specific to 511, but I believe with some tinkering anyone could figure out the best way for them. This pouch is great for duck hunting, you can keep every thing you need inside for an entire morning if you like to pack light, as it holds 21 rounds on the outside. It's very quiet.